The Trump administration announced Monday that it will seek a pay freeze for all civilian employees in 2019, confirming a plan long expected from the White House. The administration's fiscal 2019 budget proposal released Monday by the Office of Management and Budget also includes a number of provisions that would cut federal workers’ retirement and other benefits. The budget describes the pay freeze plan as the first step in moving the civil service to a pay for performance system, pairing the freeze with a $1 billion interagency fund to reward high performers. “This [fund] will replace the across-the-board pay raise that provides federal employees with increases irrespective of performance with targeted pay incentives to reward and retain high performers and those with the most essential skills,” officials wrote in a fact sheet accompanying the budget. In addition to freezing wages in 2019, Trump’s fiscal 2019 budget reintroduces a number of cuts to federal employees’ benefits and retirement programs that were proposed last year but went unimplemented by Congress. The budget would require federal workers to contribute 1 percent more toward the Federal Employees Retirement System defined benefit annuity each year for six years, and it eliminates the FERS supplement for retirees under the age of 62, which is when Social Security kicks in. The White House indicated that it plans to propose a seismic shift in the federal retirement system in the future that could remove defined benefit pensions altogether. American Federation of Government Employees National Vice President Philip Glover said such a plan could be disastrous for employees as they approach retirement. The proposal also features plans to change other federal employee benefits. It would do away with the current leave system, which offers different categories of time off for regular leave, sick days and vacation, in favor of one category of Paid Time Off, which would effectively reduce the amount of leave workers receive each year. And the Office of Personnel Management would change how it determines the employer contribution portion of the Federal Employees Health Benefits Program, shifting away from the current 72 percent of the weighted average of all plan premiums with a 75 percent cap. According to the budget, this change to FEHB premium contributions would save more than $2.7 billion over the next decade. 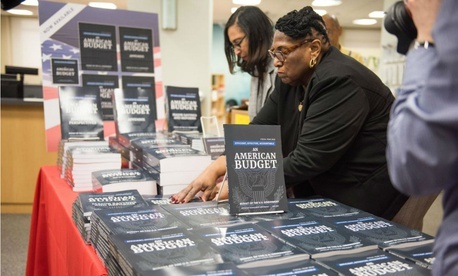 J. David Cox, national president of AFGE, told reporters Monday that Trump’s budget is a significant threat to federal employees’ livelihood, particularly following years of austerity during the Great Recession. In a statement, National Treasury Employees Union President Tony Reardon described the budget as a “full-scale assault” on the federal civil service.